Petal Talk: What Would Your Shed Look Like? What Would Your Shed Look Like? 2. a large, strongly built structure, often open at the sides or end. an outbuilding with a single story; used for shelter or storage. The site goes on to list five types of shed, including an apiary or bee house, a boathouse, coal house, toolhouse or toolshed and a woodshed (which, for some reason is described as storing firewood AND garden tools). Have you heard of she-sheds? Other terms include hen hut, and lady lair, but it’s a structure, typically built in the backyard, that can be designed with a look that's anywhere between a hut and a palace. Why the apparent trend? Lots of reasons, many of which I can rattle off from my own life, including: I had to always share a room with my sisters, I can think better without distractions, (including laundry that needs to be done and deadlines that need to be stretched), and I could decorate it any way I want. I'd describe it as an adult playhouse. Whether it is a structure for women is up for grabs in my mind. But if a man designed it for himself, it would reflect his taste and hobbies. But it would be called a "man cave." Whatever. 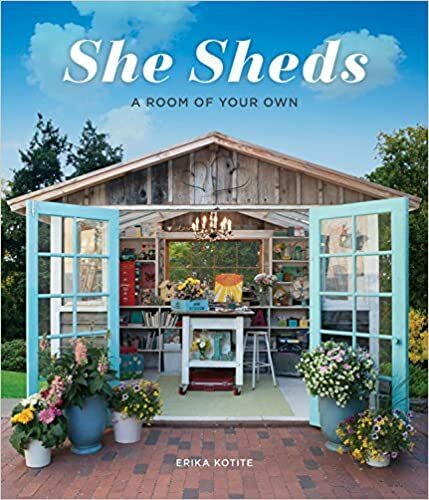 In her book, She Sheds: A Room of Your Own, Erika Kotite presents examples of sheds built by and for women all over the world. From a reinvented corn crib and transformed metal shed to built-from-scratch retreat, the sheds in the book are as diverse as their uses. Kotite was interviewed on Central Texas Gardener, where she explained a bit about how the idea came into being. If I had a she-shed, it would have a double entry, the first one a netting curtain to discourage the mosquitoes. It wouldn’t deter them. Not much does that. But it would at least slow them down and possibly lower the number of blood suckers from following me into my sanctuary. The vestibule, let’s call it, will contain a few plants. Shade-lovers, but disposable from year to year. These, I hope will serve to distract the mosquitoes while I dart into the shed. My shed would be modeled somewhat like the Year-Round Potting Shed on page 32 of the book She Sheds. One of the features I liked is the spigot so conveniently located on the outer shed wall. One of the sheds (pages 104-109) in Kotite's book even features a bathroom, a fully-functioning kitchen, and a sofa bed! Hmm... It sounds tempting. My shed would be brightly lit, courtesy of a series of awning style windows on three sides to provide a nice cross-draft. Furniture inside couldn’t be too frou-frou. We have lots of humidity, so it would be the outdoor type--two tables flanking an anti-gravity chair, which I find really comfortable. Okay, I’ll make sure there is enough room for a second chair. I would want flexibility, so there would be a two-person settee that can be hoisted up to the ceiling and out of the way unless I need seating for four. it for added work space. There would be one large, lazy ceiling fan that would not infringe on the ability to hoist the two-seater. And it wouldn’t make a sound. My shed's walls would be insulated, the insulation sandwiched between the siding and wood paneling painted white. The walls would have places for movable shelves and bins that could contain books, light throws, pillows, caps, and containers for fresh cut flowers. 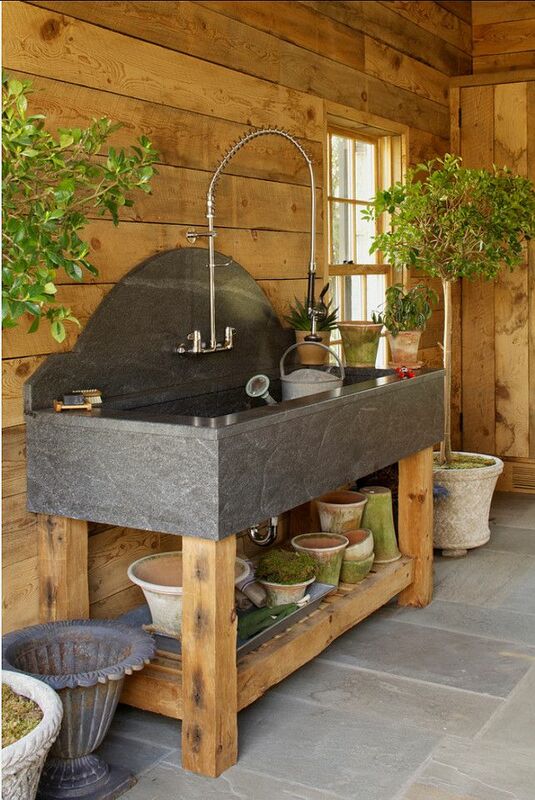 The dominant and most used feature would be a Butcher block counter and a comfy bar stool with a back. The counter would have boarded in storage below with a little door that allowed access to a trashcan. The counter would have a hole covered by a tight-fitting lid that would be flush with the table surface. This would be for cutting flowers, and easily pitching the scraps to clean up in between vases. Of course, I'd landscape around it, so the windows would have window boxes. There would be a door large enough to put the lawnmower inside, but the lawnmower would be a rechargeable electric type so there'd be no gasoline smell. The place for the mower would be walled off from the rest of the space, and be just large enough to store the mower with an electrical outlet so it could be charged. There would also be at least two outlets in the main area. That's all I have for now. But as soon as my fantasy builder finishes the outside of my fantasy shed, I'm sure I'll think of additional features. She Sheds: A Room of Your Own offers instructions on how to build a shed from a kit and some pretty cool options for windows, flooring and more. There are lots of books out there about sheds, but Kotite's book provides a ton of ideas and inspirations. If I had one, I'd consider it one of my best coffee table books. Since I don't She Sheds is one of a handful of books that will be left near my reading spot.